Bigfoot: Is this strange creature captured on video in Indonesia the real thing? At long last we are proud to announce the arrival of the new book by Dr Karl Shuker. Now, however, for the very first time and in direct response to popular demand, all of Dr Shuker’s most significant but previously disparate Nessie-themed writings have finally been brought together, and in expanded, updated form whenever possible too, to yield the present LNM compendium, covering a fascinating, extremely broad spectrum of pertinent topics. And so the Gonzo Publicity Campaign trundles into action. This last weekend we published a sneak preview of the forth coming Pink Faries album. Now we have a special preview video. Will the wonders ever cease? And just to show that we are a truly international organisation we even have a reaction from Pink Faries fans in Germany. 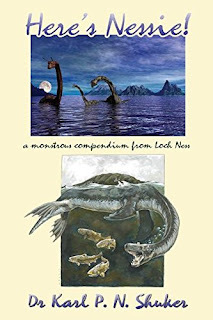 In other news, Karl Shuker’s Long awaited book on the Loch Ness monster is ready and for sale now. And, just in case this cornucopia of goodies isn't enough for you, there are new issues of the The Journal of Cryptozoology and Animals & Men just around the corner. Can things get any more groovy? ON THIS DAY IN - 1931 - Al Capone was convicted on income tax evasion and was sentenced to 11 years in prison. He was released in 1939.